Check In Policy : From 14:00 to 22:00, for any late check in please inform the hotel in advance. Meal: Room rate meal is inclusive or not of Breakfast. Ask our team to confirm your rate meal plan. Transfer service: For Airport Transfer, please kindly provide flight number and arrival time. The transfer is not included in the room rate. Children and Extra Beds : All children are welcome. One child under 4 years stays free of charge when using existing beds. Additional Extra Bed will be charged 800 per person per night. Additional Fees : For any service requested extras, the rate might not be calculated automatically in this booking invoice and is requested to be paid separately during your stay. Credit Card excepted are Visa, Master Card, JCB, and Union Pay. Smoking Area : Our hotel is non-smoking rooms. We requested all the guests to smoke at designated area outside the hotel or on the balcony. Disclaimer: All prices on our website and other sales agents are subject to change without notice. Due to fluctuations in costs, the prices may change occasionally with out prior notice. For any questions you may have, please contact us directly at head office at the resort. A friendly hotel in Ao Nang. 12 elegant rooms. 10 minutes walk to the beach. Established together with our sister company Krabi Spesialisten we are able to arrange any trip, excursion, transfers or tailor-made holidays you may desire. 12 rooms offer balconies with a view of the sunset over the famous Nopparat Thara beach and 2 of the rooms have terraces. We have twin bed and queen bed rooms as well as dual room suite for families, let us know your preference. 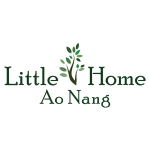 At Little home Ao Nang, all rooms have been renovated and refurnished at the end of 2014 and feature hot shower, air condition, safe and safety locks. Our rooms are split between three attached buildings and in the neighborhood you will also find the Trip Adviser favorite restaurant Carnivore. Parking spaces for cars are available in the neighborhood and motorcycles can be parked at the entrance to each building.